A 484954 is a selective inhibitor of eEF2K with IC50 value of 0.28 μM. 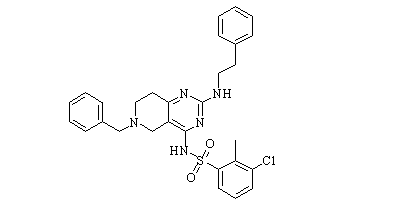 NH125 is a selective eEF-2 kinase inhibitor with IC50 of 60 nM, >125-fold selectivity over PKC, PKA, and CaMKII, and also a potent histidine kinase inhibitor. 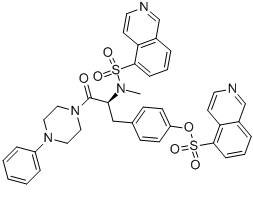 Cefatrizine, also known as BL-S-640 and S-640P, is a eukaryotic elongation factor-2 kinase inhibitor with an anti-proliferative activity toward breast cancer cells. CaMKII-IN-1 is a potent and highly selective CaMKII inhibitor with IC50 of 63 nM; significantly high selectivity against CaMKIV, MLCK, p38a, Akt1, and PKC. KN-62 is selective, cell-permeable inhibitor of CaM kinase II (IC50 = 0.9 μM). STO-609 is a cell-permeable inhibitor of calcium/calmodulin-dependent kinase kinases (CaMKK) isoforms CaMKKα and CaMKKβ (Ki = 80 and 15 ng/ml, respectively). STO-609 is a selective and cell-permeable inhibitor of the Ca2+/calmodulin-dependent protein kinase kinase (CaM-KK), with Ki values of 80 and 15 ng/mL for recombinant CaM-KKα and CaM-KKβ, respectively. KN-93 is a selective inhibitor of Ca2+/calmodulin-dependent kinase II (CaMKII), competitively blocking CaM binding to the kinase (Ki = 370 nM). KN-93 (phosphate) is a potent and selective inhibitor of Ca2+/calmodulin-dependent kinase II (CaMKII) (Ki = 370 nM), inhibiting both the α- and β-subunits of CaMKII.It does not have significant effects on cAMP-dependent protein kinase, Ca2+/phospholipid-dependent protein kinase, myosin light chain kinase, or Ca2+ phosphodiesterase activity. KN-93 phosphate is a novel membrane-permeant synthetic inhibitor of purified neuronal CaMK-II, with Ki of 370 nM.